Download yvBBCode: JoomlaCode, local file (unzip before install). yvBBCode is a BBCode extension for Joomla! 1.6. (For "Joomla! 1.5" please download yvBBCodePlugin v.1. package , the latest one is v.1.03.001). or it may be used by any Joomla! extension to provide "BBCode buttons" for editor and replace BBCodes with HTML markup in text, generated by this extension (as an example, it is integrated into my yvComment extension already). In addition to 'standard' BBCodes, this extension has BBCodes to create dynamic links between Articles. The extension is customizable, so you may choose, what subset of BBCodes to use, what images are used for buttons etc. 1. To install yvBBCode, you MUST have at least Joomla! 1.5 stable. yvBBCode is a "system plugin". If you have any problem, please read this page - it is exactly for this purpose: to make your questions answered and problems solved. Current version of yvBBCode requires Joomla! 1.6. So, if you have some problem, start with moving to the newest build of Joomla. Please note, that yvBBCode has "Debugging mode" option. Turn it on to see, how yvBBCode works. You should see something like on the pictures below. Links between Articles ('content items'...) may be created with 'special type of BBCodes' inserted into any content of the Web page and converted to Hyperlinks on the fly. Currently yvBBCode supports one BBCode for this purpose: 'contentid'. E.g. [contentid=3]Content management[/contentid] is replaced by the link to the Article with id=3. All configuration setting of this extension are set in "yvBBCode Plugin parameters" (Administrator interface->Extensions->Plugin Manager->yvBBCode). yvBBCode can make BBCode replacements for the whole page ("Enable BBCode replacements for the whole page" option). As you can see on the picture above, you may have BBCodes almost everywhere on the page, in every content... So you may have BBCodes even in those extensions, that know nothing about yvBBCode. 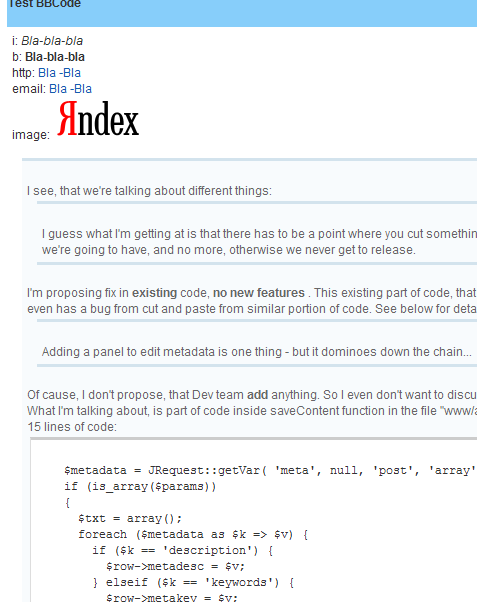 yvBBCode may show BBCodes in your Articles (working as content plugin). 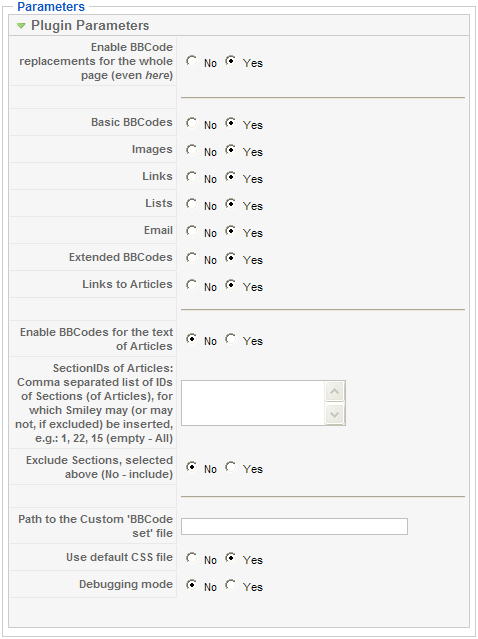 This option ('Enable BBCodes for the text of Articles') is disabled by default, but you may use it (change to 'Yes'), if you don't like 'BBCodes for the whole page' option, shown above. You may restrict work of this plugin for Articles, that belong to only some Sections. To do this, type comma (,) separated list of IDs of Sections in the "SectionIDs of Articles" parameter. Leave the field blank to allow replacement of BBCodes with corresponding HTML tags for Articles of any Section. Additional parameter: "Exclude Sections, selected above (No - include)" helps you to make this list shorter. If you don't want to process BBCodes for only a small number of Sections: set this parameter to "Yes" (i.e. "exclude"), and type (in the "SectionIDs of Articles" parameter) only IDs of Sections to be excluded. By default, yvBBCode uses simple CSS file (/plugins/system/yvBBCode/default.css), that is intended to be used as a start point for customization. If you made your customized css in your template, your have to change setting of "Use default CSS file" parameter to "No". Currently yvBBCode is translated into these languages: English, French, German, Russian. If you want to discuss yvBBCode with Joomla! community, please go to the Joomla! forum. Please refer to the "Future plans and thoughts" section below before posting Your suggestions. If you want to write your review of yvBBCode or to read other user's reviews, please go to the Joomla! Extensions Directory. If you found a bug in yvBBCode, or even developed a fix for it; if you created new translation or updated existing one - please, send them to the author! 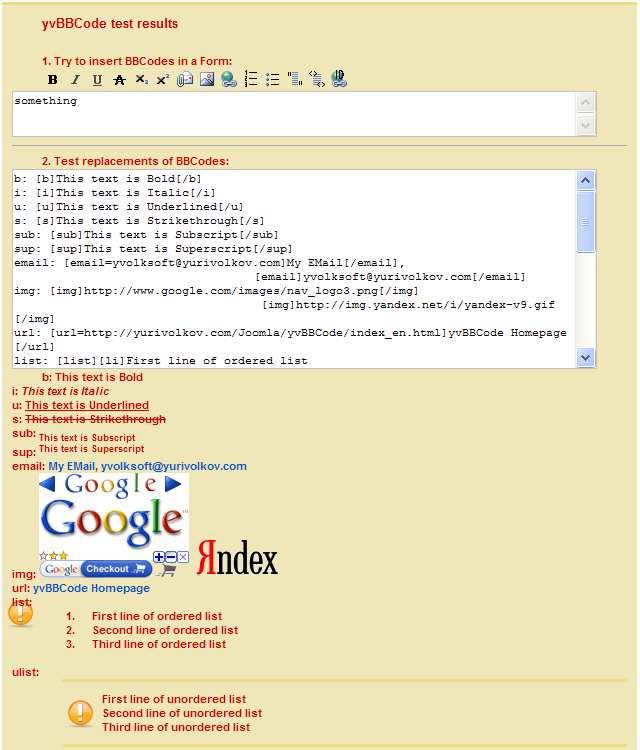 Add [quote] BBCode with support of linking to the content (Articles, Comments). The BBCode has "id" attribute to refer to the Article by its id (like in [contentid] BBCode). Improved BBCode replacement: BBCodes inside HTML tags are not replaces with HTML tags (as earlier, that caused markup error) but removed. Added [br] BBCode (to the 'Extended BBCodes') to have line breaks anywhere! (See the post). Updated function, that generates link to the Article for [contentid] (function ContentIDToURL) to v.007 . All translations were removed from main yvBBCode packages. Now yvBBCode Plugin package contain English language files only. All 4 translations were moved to 4 yvBBCodeLanguagePacks, that may be downloaded from JoomlaCode and installed separately. There is also special, 'English language pack', that is template package to be used by translators to create additional language packs for yvBBCode extension. Updated function, that generates link to the Article for [contentid] (function ContentIDToURL). Added option 'Links to Articles'. If this option is set to 'Yes', links between Articles ('content items'...) may be created with 'special type of BBCodes' inserted into any content of the Web page and converted to Hyperlinks on the fly. Currently yvBBCode supports one BBCode: contentid. French translation, thanks to Saber. yvBBode uses parser HTML_BBCodeParser library (part of PEAR Package) and BBCode images from Advanced BBCode Box MOD for phpBB. To use yvBBCode, other extensions don't need to refer to it in any way: they just trigger events, that are intercepted by yvBBCode (if its installed and enabled). If yvBBCode is not installed or is disabled, this doesn't lead to any errors! As you may see, it is VERY easy to use yvBBCode in other extensions. yvBBCode is registered to the 'onPrepareContent' event, and so it acts as ordinary "Content" plugin, replacing (in $article->text property) BBCodes with corresponding images. You may see example of yvBBCode usage in the yvComment extension.